Iron Maiden frontman Bruce Dickinson will lead a World War I dogfight re-enactment above the Sonisphere festival – just hours before he takes the stage to headline the Knebworth event. He’s part of the Great War Display Team, a group of pilots who fly replica warplanes to commemorate the actions of those who fought and died in the 1914-18 conflict. Maiden say in a statement: “The show around 6pm features nine aircraft of five different types – all exact replicas of the planes used in combat. Dickinson adds: “The show over Sonisphere is something I’m really excited about – we’re determined to put on an unforgettable display for everyone. “We’re planning an extravaganza of derring-do; the manoeuvres we’ll be performing are all based on true-life battles from a hundred years ago. Last year Maiden arranged a Spitfire flypast just before headlining the Download festival. 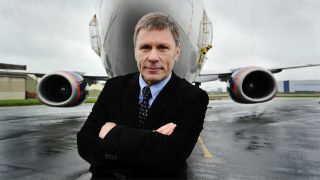 Dickinson, a qualified commercial pilot, regularly flies the band plane when they’re on tour. Sonisphere takes place on July 4-6 at Knebworth Park, marking the 40th anniversary of the first live music event in the grounds of the stately home. The Prodigy headlong on the Friday before Maiden take over with their dogfight and headline set on Saturday. Metallica close the show on Sunday with their By Request set. Meanwhile, Maiden will donate part of the proceeds from their concert in Belgrade, Serbia, on June 17 to the country’s relief effort following its worst floods in more than a century, Tanjug reports. This month, floods swept through Serbia, Bosnia and Croatia, killing at least 50 people and leaving tens of thousands homeless.